LARRY Love’s had three hours’ sleep in the past week. He may be exaggerating but not by much. Alabama 3 are working on three albums this year – so there’s work to be done. Even if you don’t recognise the nine-piece collective from the recent past, you’ll probably know them as the authors of Woke Up This Morning – which became a cult theme tune for The Sopranos. 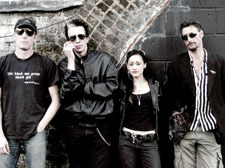 Alabama 3 play Regent’s Park Open Air Theatre on August 23 as part of Big Wheel Sundays, a series of outdoor performances, with British Sea Power headlining other dates. Alabama 3’s unique shows are known for outrageous displays, costumes, graphics and inconceivable blends of techno and country and western. But for the Regent’s Park show, expect something akin to Seasick Steve. Blues is a fascination for the band, who have played a series of jail gigs and had personal involvement in miscarriages of justice causes – displaying a “Free Ronnie Biggs” poster on their website. Larry says: “Nick Reynolds plays harmonica for us. His dad is Bruce Reynolds who masterminded the Great Train Robbery. Nick has known Ronnie Biggs for quite a few years. He went with his dad to pick him up from Rio. * Big Wheel Sundays begin in Regent’s Park on August 16 with British Sea Power, The London Bulgarian Choir and special guests. Alabama 3 play unplugged on August 23 with Kate Miller Heidke and special guests.